This year's Classic Bol d'Or will take place on Friday and Saturday, 13th/14th September, as part of the EWC Bol d'Or Paul Ricard event. The Team will comprise of 2018 European Endurance Legends Superbike Cup winners, Peter Lindén and Hugh Brasher. Preparations on the P&M GSXR1100 Suzuki are well underway and with only 4 weeks to go we hope to be ready to load by the end of the month. The Team also compete at the ICGP race at Hockenheim on 8th/9th September, for the first time with the new BSR/Phase One TZ350's. See you at the Bol. Venue of the wake is the Krazy Horse Cafe, Empire House, Lamdin Road, Bury St.Edmunds, Suffolk, IP32 6NU (tel. 01284 749645). It will be a Triumph Thunderbird funeral vehicle. Martin Gelder died of stomach cancer today. We understand that Martin had recently sufferred with stomach pain whilst on a Morini outing in Spain. On his return he cancelled several engagements including the Oschersleben WEC / 4 hrs classic weekend. After persistant pain, he sought medical advice but died shortly afterwards. 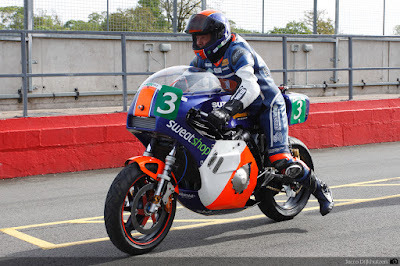 We last saw Martin at Donington Park at the 4hrs classic weekend in early May. He was then in good spirits and enjoyed some high quality time with a lot of old friends. Martin will be fondly remembered by hundreds of Phase One Endurance team members, riders, friends and supporters alike. Martin started his support for our team by helping in the workshop in the early 1990s, quickly progressing to handling the team's PR, via the Phase One Endurance website and Race 24. He will be remembered by most for being ever present at all of the World Endurance Events for a ten year period and providing in depth reportage and high quality images, from Suzuka to Le Mans, where no others were available. 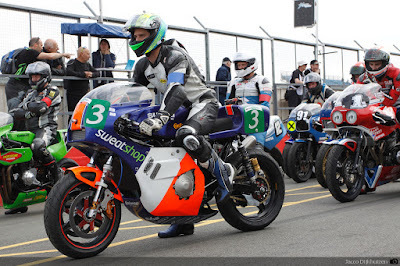 More recently Martin gave his support to the growing band of classic endurance race followers. Martin's genuine enthusiasm for motorcycle endurance racing (proper racing as he would say), combined with his photography and IT skills, brought this branch of motorsport to thousands who would otherwise have been unconnected, particularly after each event. Martin's legacy, via Race24 and its blog, includes the near single -handed creation and nurturing of a whole community that was previously unconnected and for that we thank him. At Phase One Endurance we shall remember him as a superb motorcycle photo journalist, a true friend of the team and most importantly, a genuinely nice chap. Our sympathies are with Martin's family and friends. We shall publish funeral details when we become aware of them. The team entered Hugh Brasher and Peter Linden for the two by two hours race at Spa Francorchamps over the weeked 30th June/1st July. Due to the EELC regulations not being adopted by the DG Sports, the team's 2015 GSX1230 bike had to be used to be compliant. Qualifying was predictably difficult and was topped by the RC30s of the new Evo class. Peter Linden started both legs, quickly settling into top six positions in both. 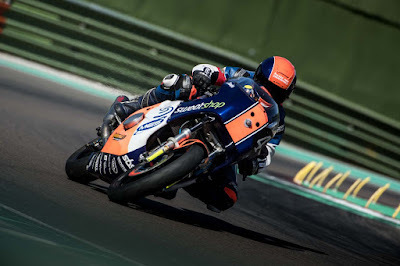 Leg one went fairly well, with the Linden/Brasher pairing finishing a creditable fifth, behind team Kaiser, who narrowly beat Linden to the flag on the Kaiser Kawasaki. Leg two was a disaster for many teams including our own. We went out of 7th place with a set of split inlet rubbers, which led to further problems, which forced retirement with just 20 mins to go. 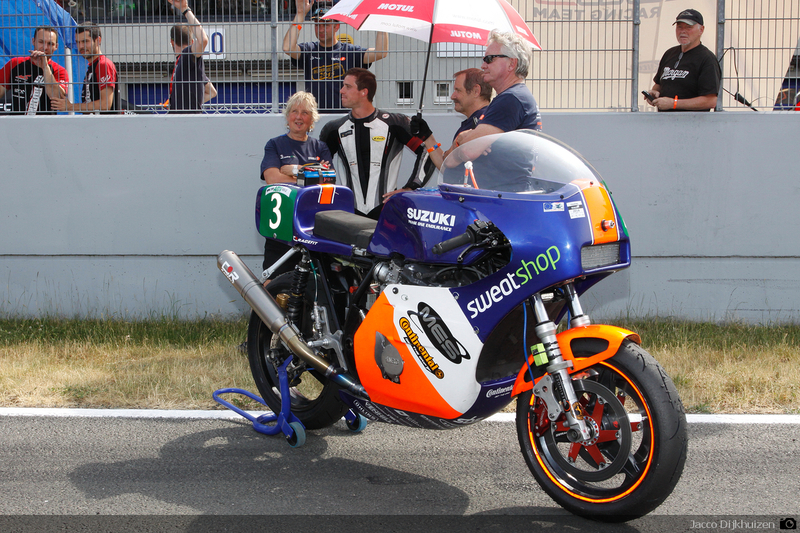 Mertens went out with RC30 engine trouble, as did Team Edge on the Harris Suzuki. 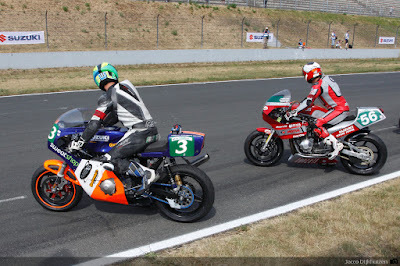 Roadrunner followed with a blown engine on their Bakker Suzuki and so did Walo/Tosolini on the Italian Honda 1000. But Perhaps the prize for the worst weekend went to Patrick Banfield and Cormac Conroy, who first retired the P&M Kawasaki with engine trouble and then went on to crash their RC30 and send Cormac to hospital with 9 broken ribs, plus a broken wrist and ankle. (He was however back in the paddock by Sunday afternoon, sporting his normal cheeky smile.despite the obvious pain). In short, an unremarkable meeting, much diminished from its peak 3 or 4 years ago. Lets hope its back to proper endurance with a 4hrs race next year, as part of a championship, with Estoril and Italy joining the fray. Thanks to all our team, sponsors and friends; sorry we could not deliver this time out. EELC - 2018 Superbike Cup Winners !! ... and all in 16 weeks. Absolutely fantastic and a credit to the team.!! Winning championships in endurance has always been about scoring at each opportunity, and that was almost what happened.! With just three races we had to work hard and use our best judgements on and off the track to score in 5 out of the 6 scoring opportunities. Let me explain. So, with the fantastic pole position under our belts (thats on rider aggregate) and fastest qualifying lap, Graeme Gowland, 1.34.4 secs, the team went into the race in a confident mood. We were all worried about the weather though... 32 deg.C would be a lot to ask a tuned oil cooled engine to endure. Both Gowland and Lindén settled into top 3 positions for the first hour and a half, crossing the mid-race 2 hours point in second place and almost scooping maximum points. All was going to plan. The pressure on the team had already eased as Team Force stopped, first with a split oil cooler and then with a heavily smoking engine. Shortly afterwards the "Continental" Yamaha FJ1300 threat also expired, also with engine failure. It was going oh so well, until, you've guessed it ...ours expired too... a big end failure at 2 hrs 40 mins.... game over. But, thanks to the hard work at rounds one and two, the EELC Classic Superbike championship was ours. Well done to all concerned, Team, Riders and Sponsors alike - enjoy the moment. (NB; Gowland's record qualifying lap was achieved on the NEW CR3 CONTI...!! Congrats to all at Continental tyres for their first CR3 pole). The meeting started on Thursday last with a trackday to test some new items, including Conti's new 17" inch front tyres, plus more track familiarisation for Hugh. [as an aside, Conti used Donington Park to launch the new Mark 3 version of the 18" Road Attack CR race tyre, which we have used so successfully in the CR2 form for 5 years. The CR3 is now available to the public and will surely prove to be the next benchmark in competitive classic racing.] Thursday's tests were very valuable as a new geometry set-up was found which was used in the race and proved competitive. The crash completely altered the team's race strategy (which had aimed to scoop the maximum mid- race points bonus) to one of simply abiding by the rules (40 mins minimum for 3rd rider and a max of 120 mins for any rider) and getting to the flag in an efficient manner.You can race as fast as you like but you cant make up 17 laps in 4 hrs. 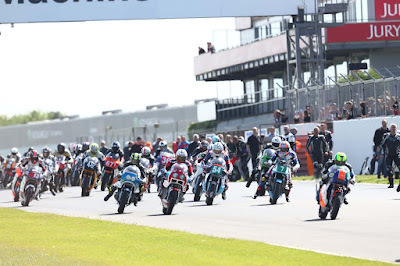 Thanks to all team members, riders and sponsors for their support.......and in particular Hugh Brasher, Maurice Walcock, Graham Matcham of Conti, plus Lee and Ray Marchant of MES. Lee Marchant of Marchant Engineering Services (MES) has confirmed sponsorship backing for the Team for the 2018 season. Team Manager Russell Benney said "What a terrific vote of confidence in the Team following its great performance at Paul Ricard two weeks ago. I know that Lee was disillusioned by the cronyism of the organisers of the ECS championship, but his enthusiasm has been firmly reignited by the arrival of the European Endurance Legends Cup (EELC). 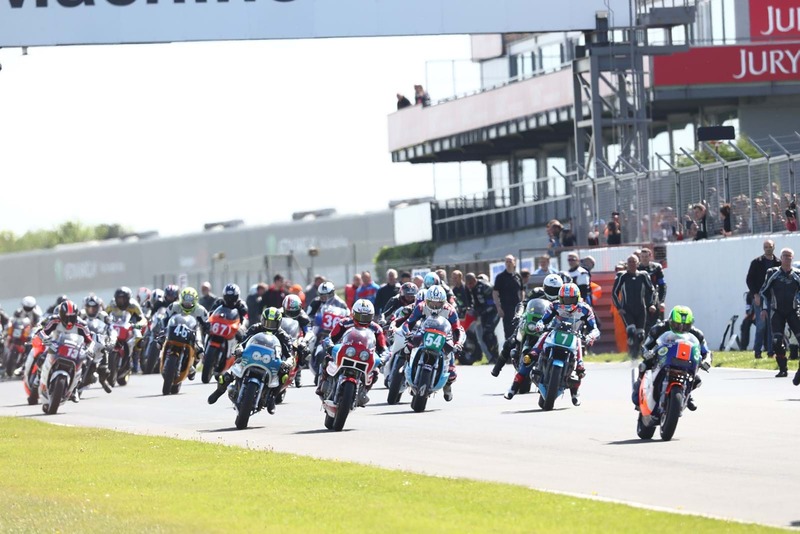 As we now find ourselves leading the Superbike class after round one, we can expect some great exposure leading up to round two at Donington Park on 13th May. The EELC organisers have already shown themselves to be on a new level in terms of being media savvy, so I know that MES will be getting even more value for money this season.We are very pleased to welcome MES as sponsorship partners once again." Lee Marchant " I followed the live timing and reports from the Paul Ricard race from the UK and just wished I could have been there. The boys did so well and leading at half distance was a highlight. The other was Peter's big push on laps 94-96 to try to retake third when he scored the team's fastest lap. Absolutely great. I am very happy to continue to sponsor the team in this important inaugural year for the EELC and look forward to some more close racing and great images"